I think this is just an awesome thing to do. If your famous youre gonna have fans so why not take it in and enjoy and be nice, I hate those players that are so cocky and don't do anything. 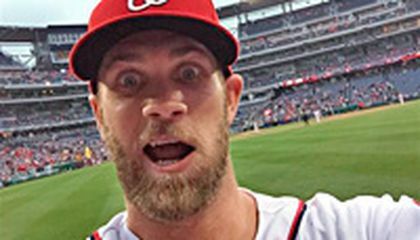 I thought it was really strange that Harper actually took a selfie with the fans phone. I don't think any other baseball player would actually do hat. he fosters a relationship with fans because he's a great player with a good reputation and he has a lot of fans who he loves and he wants to give back as much as possible. Bryce makes relationships with the fans because so they can know that personal, he's a nice and caring person. So he tries to interact with his fans. Selfiing is taking over the world and is going into major league sports today. We need to stop this epidemic before it takes over our world more then it already has. This is very cool. Players should be more like this because it makes them more special to fans. Fans have a chance actually meet their favorite players. Bryce Harper fosters a relationship with fans because having a connection with fans makes the fans feel closer to the person they look up to. In this case Bryce Harper wanted to show his fan/s that he acknowledges their presence. It was a playful action in his part to also show the audience that his fame doesn't make him stuck up or serious and boring. 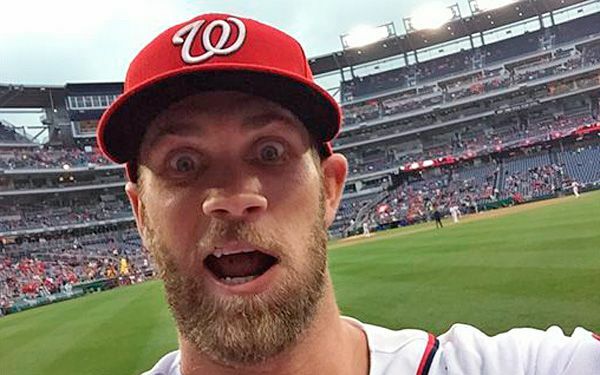 Bryce Harper is a great baseball player who loves his fans. Although the latest All-Star voting results released by major league baseball showed Harper leading all National League players with more than 2.5 million votes. However I think he won because he took a fan phone and took a Selfie ,an gave the phone back to the fan that had attend numerous of his games.